Crab apples (Malus) make attractive, profusely flowering small to medium sized, deciduous trees. Wild varieties from both the old and new world are the precursors of the cultivated varieties of dessert apples. 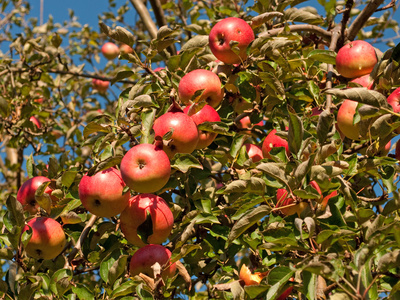 They are considered too large for small gardens but those with a dwarfing rootstock could be planted, though falling fruit and leaves could be a nuisance. Their attraction is the many clusters of flowers appearing in mid to late spring, developing into colourful apple-like fruit in the autumn. The leaves are similar to domesticated apples. A bonus is the attractiveness of the blossom to bees. The fruit is a food source to other forms of wildlife and can be used for preserves. Malus coronaria ‘Charlotte’ is an open spreading late variety with semi-double pink tinted white flowers. The Japanes crab, Malus floribunda, is denser, with curved branches, heavy with pink flowers growing from red buds. Malus x purpura has crimson flowers. Crab apples grow in any fertile, well drained soil, preferably in full sun. They are hardy to -300C. Many are susceptible to scab, canker, mildews and fireblight. Any weak growth should be removed to maintain shape. Propagation is by grafting on to root stocks.